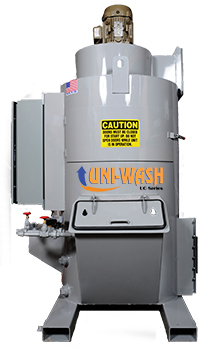 The Uni-Wash scrub is the technology behind most efficient wet dust collectors on the market, the Uni-Wash series of dust collectors are capable of collecting dust down to 3 micron in size utilizing only 3″ wg. 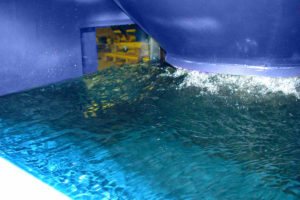 Dust laden air enters the unit from the inlet duct work and is directed to the surface of the water where heavier particles strike the water surface and sink to the bottom of the tank. Dust laden air is then pulled into the scrub cone along with surface water where it creates a series of water curtains along with a torrential washing action. This traps and removes finer particles from the air stream. Material then dissolves and / or settles down into the tank where it is removed as sludge. Fine mist lifts into the Mist Eliminator section where it is separated from dry air which is released to the fan. Water from the mist is released back into the scrub where it eventually returns to the tank. 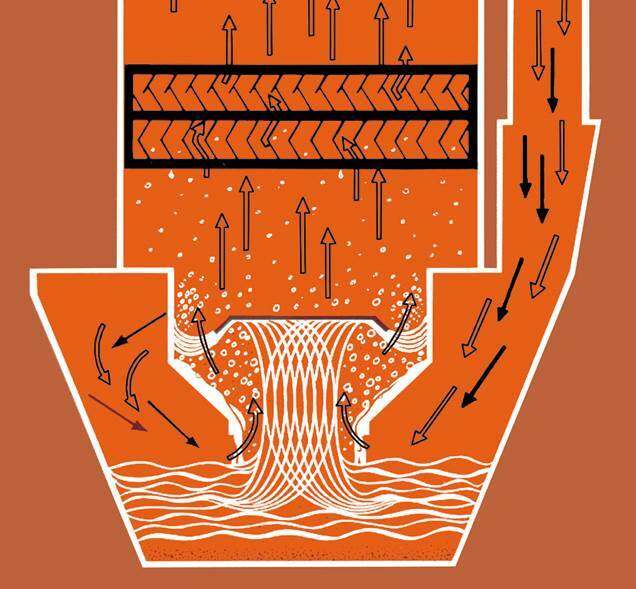 The unique Uni-Wash “orifice / impingement” scrub occurs above the water line which means it doesn’t clog or lose airflow as with nearly all other “internal venturi” methods. Uni-Wash Wet Dust Collectors have been the preferred technology of companies such as Boeing, Pratt & Whitney and Delta Airlines among many others for many years. ProVent’s commitment to manufacturing strong, heavy duty, high quality equipment sets us apart from those attempting to provide a much lesser product to industry. Uni-Wash wet dust collectors are fully complaint with the NFPA 484 standard when purchased with the NFPA 484 package. 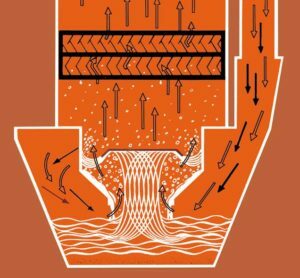 Click here to find out more about Uni-Wash wet dust collectors. Call us today to find out more about how wet dust collection can be used in your application.